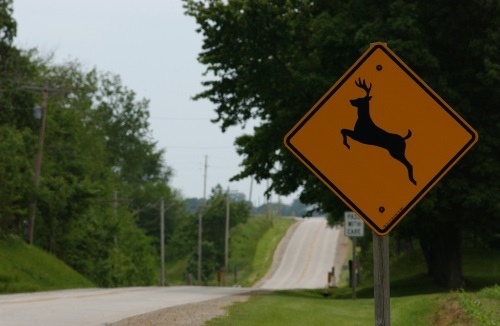 The 16th annual State Farm deer-vehicle collision study, released on Oct. 1, indicates that U.S. motorists are less likely to be involved in a collision with a deer, elk, moose, or caribou in 2018 compared to previous years – and this despite the fact that there are nearly four million more licensed U.S. drivers in 2018 compared to 2017 and that vehicle miles travelled or VMT has increased, according to Federal Highway Administration data. State Farm’s research indicates that U.S. motorists have a one in 167 chance of colliding with a deer, elk, moose, or caribou this year, compared to a one in 162 chance in 2017. The insurance company estimated motorist collisions with deer, elk, moose, and caribou across the U.S. dropped slightly to 1.33 million between July 1, 2017 and June 30, 2018 — down from 1.34 million in 2017. Yet the costs to motorists of collisions with deer or related animals is rising, according to news reports, as damage caused by an encounter with said types of animals – a male deer can weigh up to 300 pounds – jumped $162 to $4,341 per claim from 2017 to 2018 period. In terms of states where the chances of hitting a deer is highest, State Farm said that for the 12th consecutive year, West Virginians were most likely to hit a deer. However, the likelihood of having an insurance claim involving a deer was one in 46 for West Virginia drivers; down three points from 2017. The insurance company noted that the chance of hitting a deer or other large animal doubles in the fall, with November, October and December, in that order, as the months for the highest number of claims nationwide. Yet those “high claim” months can vary depending on the state and its particular type of deer population. In 2017, WisDOT said Wisconsin law enforcement agencies reported 20,482 deer-motor vehicle crashes, which resulted in nine fatalities – six of them motorcyclists.